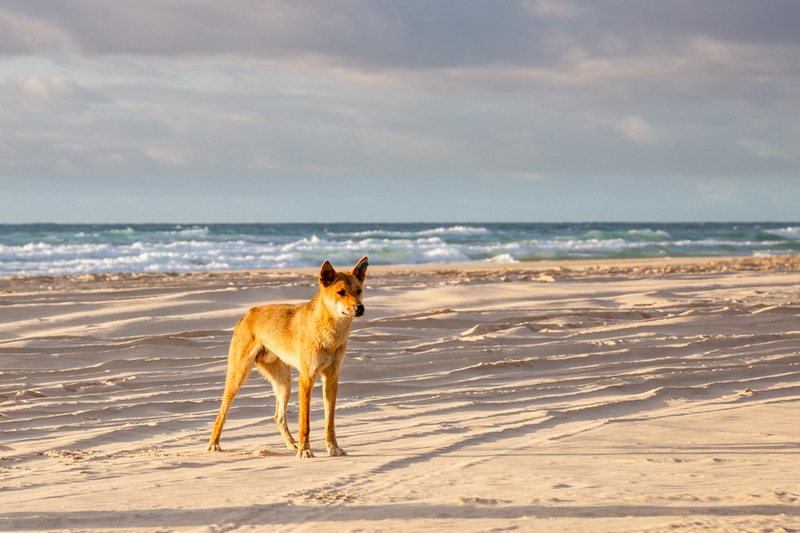 Dingoes are opportunities hunters. You will often see photos of them eating just about anything you can imagine in the Australian landscape - sharks, kangaroos, coconuts, birds, fish, roadkill and more. Their diet normally consists of small game, fruit, plants and carrion, but they will attempt to tackle just about anything to satisfy their hunger. They are the largest predator in Australia and are considered to be at the top of the food chain. They hunt mostly at dawn or dusk, mostly alone, but will sometimes hunt in packs. Their main prey is warm blooded animals, but being an opportunist, they will eat just about anything that they can. In parts of Australia where both dingos and livestock are present it has been known that they will attack farm animals if food is scare elsewhere. This often results in dingo and human conflict. This is a non-issue on Fraser Island as there is no livestock for them to hunt! They will however, scavenge off humans that visit the island if they can. They have been known to pillage campsites and go through garbage in search of food. For this reason, it's important to ensure any food scraps are secured so they are unable to get at it and make sure everything is disposed of properly. If they are successful in scavenging from their human guests, they are likely to form bad habits like associated humans with food - never a good combination when it comes to apex predators!